John BENJAMIN (1585 – 1645) was Alex’s 11th Grandfather; one of 4,096 in this generation of the Shaw line. Harvard College was established in 1636, the same year John’s mansion burned down, and Harvard owns the land that originally belonged to John Benjamin. It is believed that John Benjamin and Governor John Winthrop were friends due to attending Cambridge University and Gray’s Inn, and that is why John came to America. That may be true, though I haven’t seen definitive proof John Benjamin’s attendance. John Benjamin was born on 12 Mar 1585 in Chalvington, Heathfield, Sussex, England. He was christened on 21 Mar 1585 in Chalvington, Heathfield, Sussex, England. His parents were John BENJAMIN Sr. and Joan HOOKES. He married Abigail EDDYE in 1619 in Cranbrook, Kent, England. John arrived with his family in Boston Harbor, Sunday evening, 16 Sep 1632, on board the Lyon. His brother, Richard Benjamin, came with him on the same voyage and settled in Southold, Long Island. They sailed from London June 22, 1632, arriving in Boston September 14/16, 1632. The master, William Pierce, brought 123 passengers. “He brought one hundred and twenty three passengers, whereof fifty children, all in health. They had been twelve weeks aboard and eight weeks from Land’s End.” The Lyon made four trips: 1630, 1631, 1632, 1632. The Lyon hit a reef April 10, 1633 (Peirce was ‘driving’) and it sunk, replaced by the Rebecca, built in the colonies. Benjamin, John of Heathfield, Sussex and wife Abigail (From Haethfield, Sussex, bound for Cambridge and Watertown. Ref: Banks Mss. 36 pg 171. Listed with a Richard Benjamin. 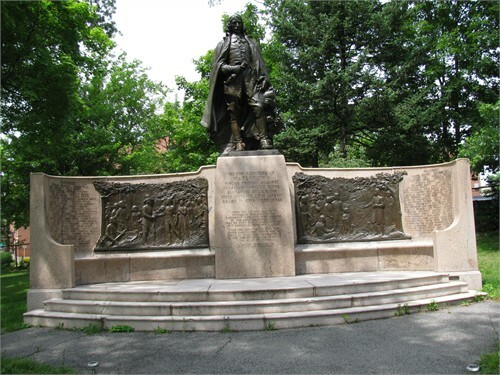 In 1642 he was the largest landed proprietor in Newtowne, now Cambridge, Massachusetts. The will of John Benjamin was in the handwritng of Governor Winthrop, who in his writings refers to the comfort and elegance of his residence in Cambridge .John died on 14 Jun 1645 in Watertown, Middlesex, Massachusetts. Abigail Eddye was born on 1 Oct 1601 and was christened on 6 Oct 1601 in Cranbrook, Kent, England. Her parents were Rev. William EDDY, Vicar of St. Dunstan’s Church, Cranbrook, Kent, England and Mary FOSTER (Fosten or Faston). Abigail died on 20 May 1687 in Charlestown, Mass. CHURCH MEMBERSHIP: Church admission prior to 6 November 1632 implied by freemanship (probably to Watertown church, as Cambridge church had not yet been organized). EDUCATION: His inventory included “2 volumes of book of Martire [i.e., Book of Martyrs],” £1 10s. ; “Mr. Perkin’s works, 3 volumes,” £1 4s. ; “an English Expositor on Matt: & John,” £1; “a law book,” 5s. ; “Mr. Rog[ers] treatises,” 6s. ; “two concordances,” £1; “3 or 4 other books,” 3s., for a total of £5 8s. ; and, in another part of the house, “an old chest with books & all the iron lumber,” 7s. Governor Winthrop was from Groton, England and was married to Thomasine Clopton of Groton. John Eddy (Abigail’s brother) married Amy Doggett of Groton. Amy’s cousin, Thomas Doggett, married Margery Clopton of Groton (the sister of Governor Winthrop’s wife Thomasine). Therefore, Thomas Doggett and Governor Winthrop were brothers in-law. John Eddy’s wife was the cousin of Governor Winthrop’s in-laws. John Benjamin and Governor Winthrop were distant in-laws. Abigail’s brothers, John and Samuel Eddy, came to America two years before the Benjamins and John Eddy settled in Watertown about four years before John and Abigail, explaining why John Benjamin built his second home in Watertown. The Winthrops, Cloptons, Doggetts, Eddys, and Benjamins all knew each other in England before coming to the new world. 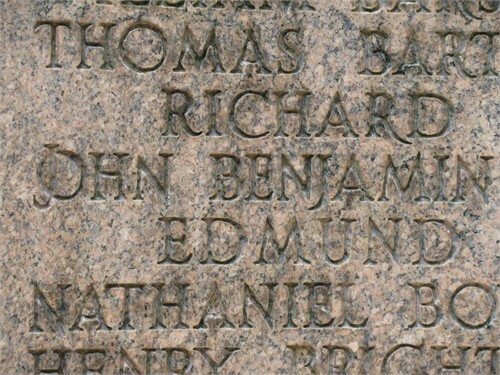 If John Benjamin did not befriend Governor Winthrop at school, it is likely they were friends due to marriage of common acquaintances and relatives. John was an early resident of Cambridge, Mass., arriving in 1632. 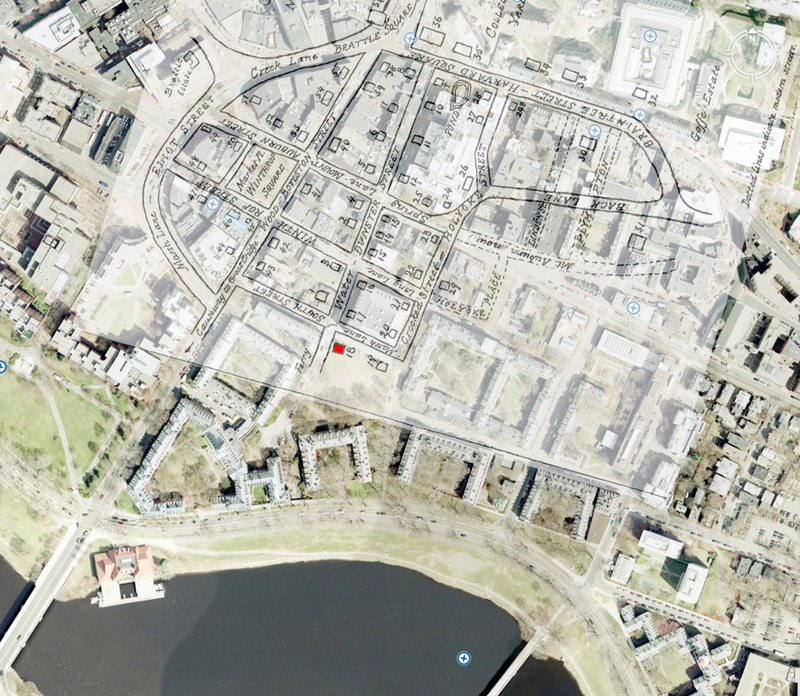 The site for what would become Cambridge was chosen in December 1630, because it was located safely up river from Boston Harbor, which made it easily defensible from attacks by enemy ships. Also, the water from the local spring was so good that the local Natives believed it had medicinal properties. The first houses were built in the spring of 1631. The settlement was initially referred to as “the newe towne”. Official Massachusetts records show the name capitalized as Newe Towne by 1632. 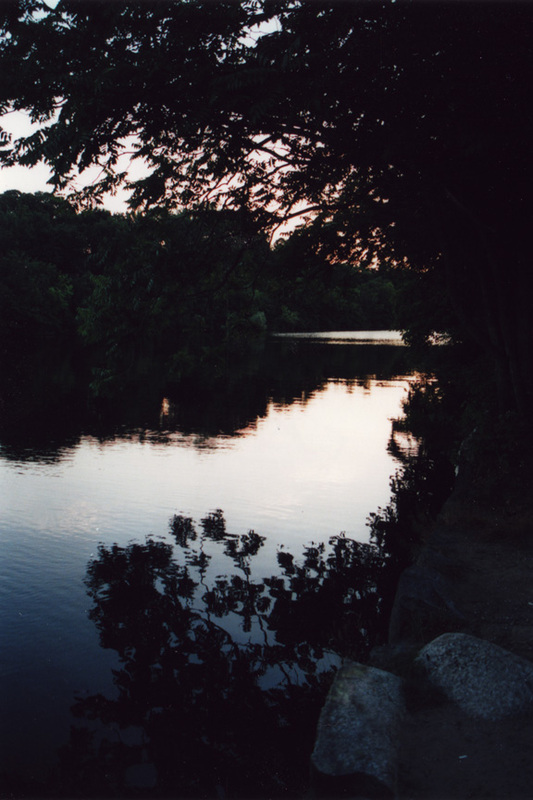 Located at the first convenient Charles River crossing west of Boston, Newe Towne was one of a number of towns (including Boston, Dorchester, Watertown, and Weymouth) founded by the 700 original Puritan colonists of the Massachusetts Bay Colony under governor John Winthrop. The original village site is in the heart of today’s Harvard Square. John was a pioneer in Watertown, Mass. Watertown, first known as Saltonstall Plantation, was one of the earliest of the Massachusetts Bay settlements. It was begun early in 1630 by a group of settlers led by Sir Richard Saltonstall and the Rev. George Phillips and officially incorporated that same year. The alternate spelling “Waterton” is seen in some early documents. 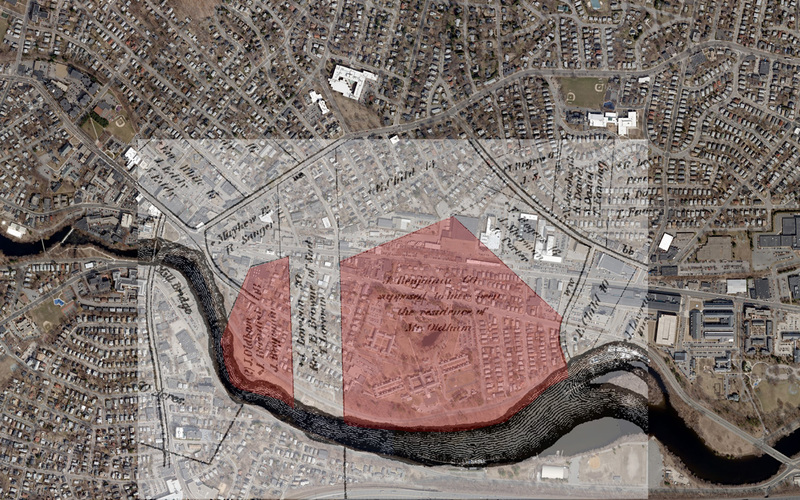 The first buildings were upon land now included within the limits of Cambridge known as Gerry’s Landing. For its first quarter century Watertown ranked next to Boston in population and area. Since then its limits have been greatly reduced. Thrice portions have been added to Cambridge, and it has contributed territory to form the new towns of Weston (1712), Waltham (1738), Belmont (1859), and Lincoln (1754). In 1632 the residents of Watertown protested against being compelled to pay a tax for the erection of a stockade fort at Cambridge; this was the first protest in America against taxation without representation and led to the establishment of representative government in the colony. Here about 1632 was erected the first grist mill in the colony, and in 1662 one of the first woolen mills in America was built here. The view of the Charles River today from the site of the Benjamin homestead in Watertown. Appointed with Joseph Weld to sell land of Mr. Richard Gurling, and settle his estate, 19 Sep 1637. ESTATE: Granted one acre for a cowyard at Cambridge, 5 August 1633; granted “all the ground between John Masters … and Antho Couldbyes,” 2 March 1633/34 granted “the marsh between [word missing] Windmill Hill and the creek next to it,” 1 Sep 1634; given proportional share of 5 in meadow (among the largest shares), 21 Apr 1635 ; on 8 Feb 1635/6 in the list of those with houses in town, John Benjamin appears in the West End with a rating of two, and also on the south side of the river is a lot which had been held by William Wetherell, but annotated as “sold to Mr. Benjamin & by him to Edm Angier”; on 17 March 1635/36 William Wetherell sold for £8 to John Benjamin a house and twelve acres of land on the south side of Charles River; on 24 March 1635/36. William Ruskew sold for £1 10s to John Benjamin one acre in shipmarsh. 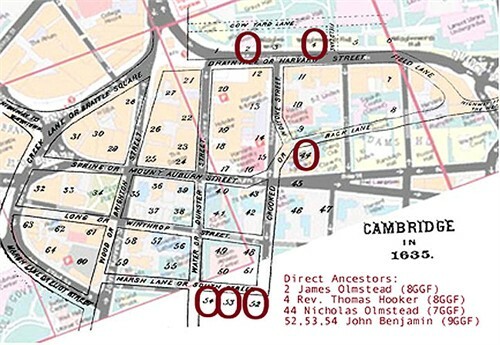 In the Cambridge Book of Possessions, John Benjamin appears on 4 June 1635 with three parcels: one house and lot in West End, six acres; one-quarter of an acre in town; and three acres on the west side of Charles River; in the Cambridge land inventory of 6 September 1642 he held two parcels: one dwelling house with six acres in the West End, and twenty-seven acres in the Great Marsh. On 7 April 1636 Winthrop reported “Mr. Benjamin’s house burnt, and £100 in goods lost”. In the Watertown Inventory of Possessions, John Benjamin held four parcels: sixty-acre homestall, eighteen acres of upland with two acres of meadow, eighty acres of upland in the Great Dividends, and twenty-four acres of plowland in the further plain; the third and fourth of these lots had previously been held by Robert Feake. In the Composite Inventory he held the same four parcels. On 28 February 1643 John Benjamin of Watertown sold to “Barnabye Wind junior … one house with two acres of ground adjoining, also eight acres of land lying in a common corn field” [ SLR 1:51]. In his will, undated but proved on 3 July 1645, John Benjamin bequeathed to “my son John a double portion of my estate & my beloved wife two cows, forty bushels of corn out of all my lands to be allowed her towards the bringing up of my small children yearly such as grows upon the ground, one part of four of all my household stuff, all the rest of my lands, goods & chattels I will shall be equally divided between seven other of my children, provided that out of all my former estate my will is that my wife during her life shall enjoy the dwelling house I live in & three acres of the broken up ground next the house, & two acres of the meadow nearhand belonging to the house”; in swearing to this will John Eddy said that John Benjamin “did further declare (as an addition to this his will) that his wife should have liberty to take wood for her use upon any of his lands during her life”. The inventory of the estate of John Benjamin (which was not totalled) included real estate valued at £162: “dwelling house with the whole land & meadow next the mill,” £50; “the lot bought of John Bernard containing threescore acres of land with a house upon it & all belonging to it,” £75; ten acres marsh land at oyster bank, £10; “ten acres marsh in Rocky Meadow,” £3; “80 acres of great dividend,” £12; and “16 acres of Capt. Sedgw[ick],” £12. On 1 September 1646 “George Pickrom of Watertowne & Ester his mother” sold to “Joshua Stubs & Abigail Benjamin his mother-in-law … a homestead of sixteen acres together with … the great dividend, plow ground, meadows or whatsoever lands belongeth to them with farms …” [ SLR 1:78]. On 22 March 1646[/7?] “Abigail Benjamin & Joshua Stubbs executors to John Benjamin granted unto Jeremiah Norcrosse a parcel of land in Watertowne containing sixteen acres …” . 10 Aug 1630 Abigail’s brother John Eddy, his wife Amie, and daughters Mary and Sarah, set sail for America on the ship “Handmaid” from the Port of London England, along with Abigail’s younger brother Samuel (age 22), about sixty other passengers, and twenty-eight cows. After twelve rough weeks at sea, theHandmaid landed at Plymouth settlement, in the Colony of “New Plymouth” (now Massachusetts) on October 29, 1630 O.S. 11 Nov 1630 – Escorted by New Plymouth Colony’s Military Advisor Capt. Myles Standish, John and Samuel Eddy traveled North to the town of Boston in order to establish residency in the Massachusetts Bay Colony. Neither had the proper “dismissal papers” releasing them from the New Plymouth Colony, and after being refused entry, returned to Plymouth. Previous to February 26, 1631/32 O.S.. John obtained the proper papers and along with his family, resettled in the Bay Colony at Watertown (see map) just West of Boston. Genealogically speaking, John Eddy became “John Eddy of Watertown”. John’s wife Lydia Allen was born 1624 in Watertown, Middlesex, Mass. Her parents were William Allen ( 23 Mar 1602 in Allen Hall, Stratford, St Hulme, Wales – 10 May 1679 in Manchester, Essex, Mass.) and Anna Goodale (1601 – 1678). Lydia died 10 Jan 1709 in Watertown, Middlesex, Mass. Lydia’s father William Allen, who was in Boston, November 13, 1673, a refugee from New York at the time of the capture of that town by the Dutch. He made his will December 15, 1674, which was probated January 26, 1674-5. (Suffolk Probate, Vol. 6, p. 133.) The testator bequeaths “unto Lydia Benjamin, wife unto John Benjamin of Watertown.” On January 26, 1674/75 (at the time of probating the will), John Benjamin appeared in court and renounced his executorship, “in the right of Lydia his wife, to the will,” this done as he attests, freely. They had eight children and remained near Boston all their lives. 1662- Removed to Harford, CT. Removed back to Watertown, MA 5 April 1681- Exempted from military training (He was 61). Was member of Colonial Militia. Abigail’s first husband Joshua Stubbs was born 1622 in England. They had three children, and moved to Charlestown in 1654 where Joshua died Joshua died in 1654. Abigail’s second husband John Woodward was born 1621 in Ipswich, Suffolk, England. His parents were Richard WOODWARD and Rose STEWART. John died 17 Feb 1695 in Watertown, Mass. Samuel’s wife Mary [__?__] was born 1631. Mary died in 1669 in Watertown, Middlesex, Mass. and Mary, bom in Watertown, May 12, 1666. Joshua’s wife Thankful Stowe was born 4 Jan 1659 in Concord, Middlesex, Mass. Her parents were Nathaniel Stowe and Elizabeth [__?__] Thankful died 4 Mar 1691 in Charlestown, Middlesex, Mass. Caleb’s wife Mary Hale was born 29 Apr 1649 in Wethersfield, Hartford, Connecticut. Mary died in 1700 in Wethersfield, Hartford, Connecticut. Mary’s father Samuel Hale was born on 1 Jul 1615 in Walton At Stone, Hertford, England. He married Mary Smith in 1642 in Wethersfield, Hartford, Connecticut.He died on 9 Nov 1693 in Glastonbury, Hartford, Connecticut. Mary’s mother Mary Smith was born in 1612 in Norwich, Norfolk, England. She died on 19 Jan 1712 in Wethersfield, Hartford, Connecticut. (Died 8 May, 1684.) Invt. £77-15-06. Taken by Samuel Haile sen., Joseph Hill. The children: Mary, age 13 years, Abigail 11, Sarah 8, John 6, Samuel 5, Martha 3, Caleb 1/2 years old. Court Record, Page 93–4 September, 1684: Adms. to Mary, the Relict. Page 135–(Vol. VII) 7 November, 1709: This Court do order the Clerk to issue forth a Writ to cite Walter Harris sen. of Glastonbury to appear before this Court on the 1st Monday of December next to render an Account of his own and his late wife her Adms. on the Estate of CalebBenjamin, late of Wethersfield, Decd. And a double portion to John Benjamin, & single portions to each of the other Children now living. And appoint John Hubbard sen., Benjamin Talcott and Thomas Kimberly, Dist., to divide the Lands & remaining Moveables. Abel’s wife Amity Myrick (Amithy, Amathea Merrick) was born Feb 1654 in Windsor, Hartford, Connecticut. Perhaps her father was John Myrick. Amathea died 10 May 1713 in Charlestown, Suffolk, Mass. This entry was posted in 13th Generation, College Graduate, Historical Monument, Historical Site, Immigrant - England, Line - Shaw, Pioneer, Public Office and tagged Harvard Yard, The Lyon 1632, Watertown Founder. Bookmark the permalink. Thank you for some interesting information. 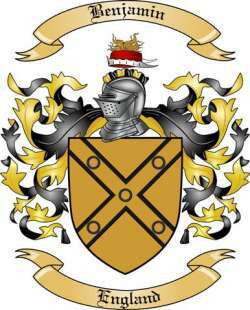 I an a direct descendant (11 generations) of John Benjamin.